DETROIT, MI [COCC] -- The Council of Orthodox Christian Churches of Metropolitan Detroit (COCC) will sponsor "Christ is Born! Glorify Him! 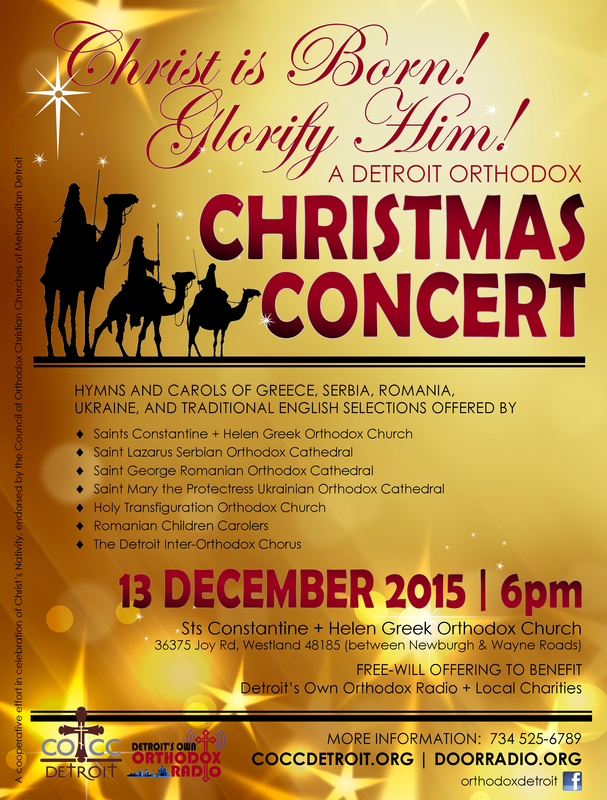 A Detroit Orthodox Christmas Concert" on Sunday, December 13 at 6 p.m. at Sts. Constantine & Helen Greek Orthodox Church, 36375 Joy Road, Westland. The first part of the concert will feature Nativity hymns and carols from Greece, Romania, Serbia and Ukraine sung by choirs from five Orthodox churches: Sts. Constantine and Helen, directed by Maritsa Kalasz; Holy Transfiguration Orthodox Church, Livonia, directed by Sharon Gomulka; St. George Romanian Orthodox Cathedral, Southfield, directed by Subdeacon John E. Lazar; St. Lazarus Serbian Orthodox Cathedral, Detroit, directed by Petra Koprivica; and St. Mary the Protectress Ukrainian Orthodox Cathedral, Southfield, directed by Mykola Newmerzyckyj; and by a group of Romanian Children Carolers, directed by Simona Ghilezan. The second part of the concert will feature Nativity hymns and carols sung in English by an inter-Orthodox chorus directed by Matushka Victoria Kopistiansky. It will conclude with a sing-along of popular Western Christmas carols. A free-will offering will be collected during the concert to benefit "Detroit's Own Orthodox Radio" program (DOOR), which is broadcast on Sundays from 4 to 5 p.m. on radio station WNZK - 690AM. Visit www.DOORradio.org for live-streamed and archived episodes and further information. An afterglow reception with refreshments will follow the concert. The public is invited to attend the concert. For further information, contact Olga Liss at (248) 252-8184 or detroitorthodoxchristmas@yahoo.com.